Prepare spaghetti squash using Beth’s method.. While squash is cooking clean mushrooms and remove the stems. 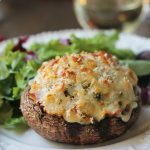 Place mushrooms in a rimmed baking pan, coated with cooking spray or olive oil. When squash is ready,remove from oven and roast mushrooms until tender, about 20 minutes at the same temperature. Prepare squash and set aside. In large saute pan heat oil over medium-high heat. Add onions to pan and saute until translucent, about 3 to 4 minutes. Add tomatoes to the pan and continue sauteing for another 3 minutes, the juice from the tomatoes will produce a bit of a sauce. Add in spaghetti squash and toss to combine all ingredients. Salt and pepper to taste. Remove from heat and stir in baby spinach, when well combined, spoon spaghetti mixture onto mushroom caps, top with cheese and 1 tablespoon each of panck crumbs. Bake for 10 to 12 minutes or until cheese melts. Allow to cool slightly, serve and enjoy!